In neighbouring Petaling Jaya, Selangor however, the satellite city’s office space market is enjoying healthy demand despite not having as many Grade A office buildings as Kuala Lumpur. According to real estate consultancy Savills Malaysia, 51% of the total office space supply in PJ are Grade B, C and stratified office buildings while the remaining are Grade A buildings. *What's the draw at Uptown? *PJ New Town – ripe for rejuvenation? The National Property Information Centre’s (Napic) Commercial Buildings: Occupancy and Space Availability Report showed that the occupancy rate for purpose-built offices in PJ (Chart 1) has been rising steadily from 64.4% in 2013 to 75.9% in 2017 before registering a dip recently in the third quarter of 2018 (3Q2018) to 72.8%. 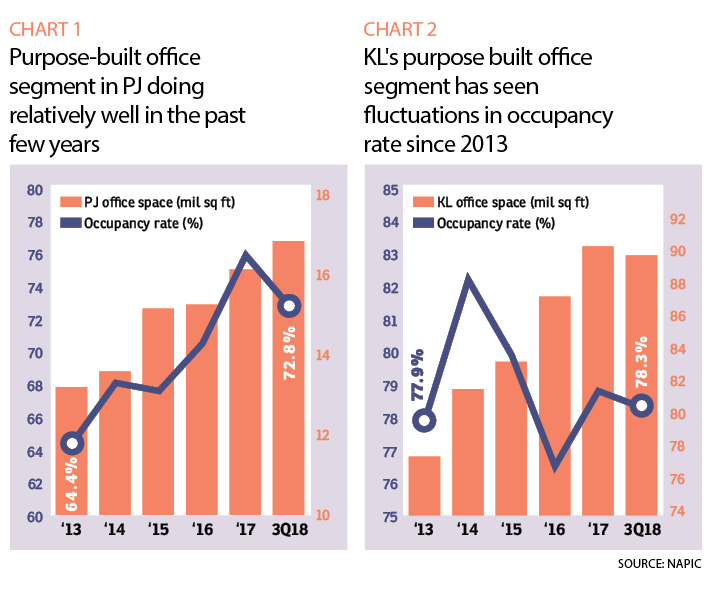 In comparison, during the same five-year period, KL’s office average occupancy rate had dropped to 78.3% in 3Q2018 from a peak of 82.2% in 2014 (Chart 2). In fact, the average office rental rates for purpose-built offices in PJ have also been on the rise. The current monthly rental rate ranges from RM4.80 to RM5.50 psf, higher than the RM3 to RM3.50 psf and RM3.80 to RM4.50 psf recorded in 2008 and 2013 respectively, according to CapVen Consultancy Sdn Bhd. So what’s driving the demand and rental of PJ office spaces? Industry experts who spoke to EdgeProp.my attributes the success of the market to several factors, namely the limited office space supply, the affordable rents for good building quality, proximity to a good talent pool of workers and easy access to public transport. “Purpose-built offices in PJ are doing well because it is a location where people want to be, particularly, those offices located next to the MRT (mass rapid transit) and LRT (light rail transit) stations as they enjoy good connectivity,” says JLL Property Services (Malaysia) Sdn Bhd managing director YY Lau. “PJ is where people live and where talent can be tapped from the many universities and colleges there. It is a mature township with a population of over 619,900 according to the Petaling Jaya Council. It has all the trappings of a modern lifestyle including easy access to every convenience including good food available at every corner,” she adds. 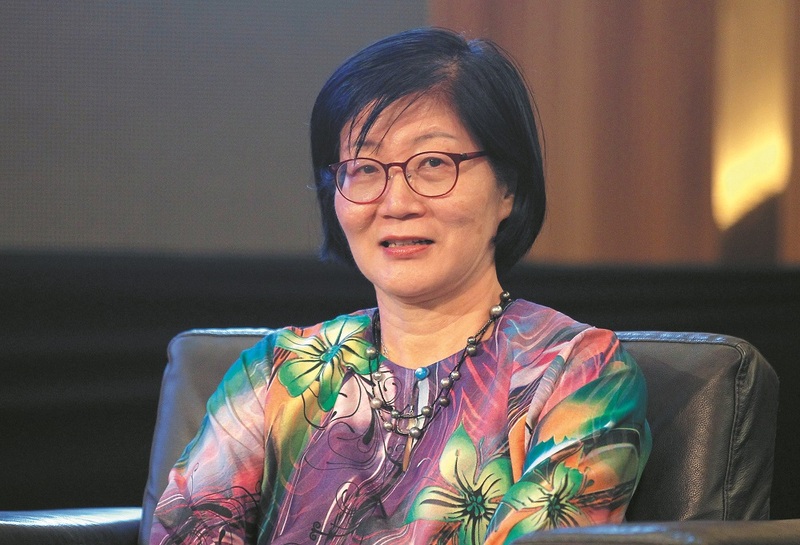 Apart from that, office rents in PJ are generally lower than in the KL city centre and KL fringe markets, which is a major pull factor for tenants, she said. 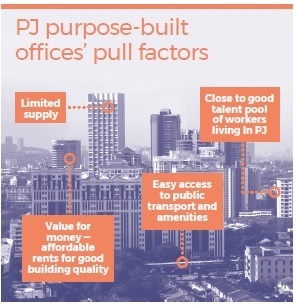 “Prime purpose-built offices in PJ that are generally well connected and near conveniences and amenities have seen positive improvements in rents. In 3Q2018, the average asking gross rent of Grade A offices in PJ tracked by JLL was RM5.02 psf, a 10% rise from 2013,” she said. Between 2013 and 2017, Lau says office demand in PJ has been growing with a cumulative positive net absorption of more than 1.3 million sq ft with demand coming from companies involved in business process outsourcing (BPO), information technology, as well as pharmaceutical and medical technology. 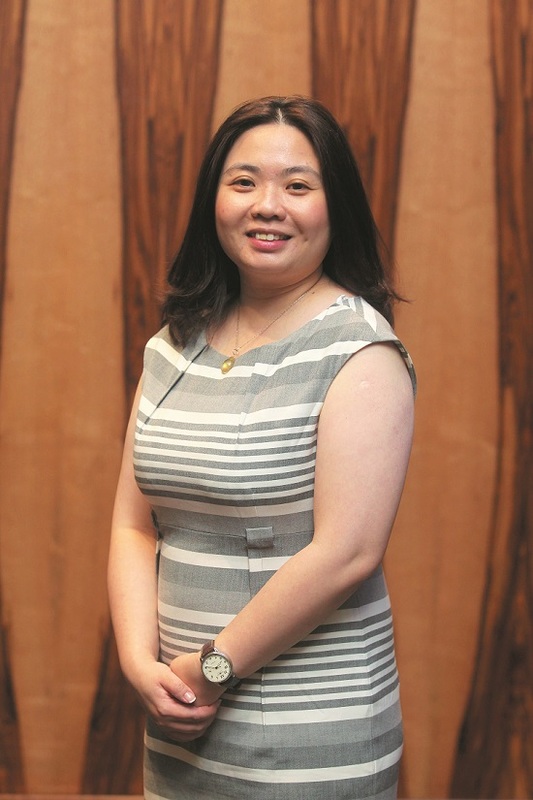 “Improvement in accessibility and public transport, the large car park capacity of the office buildings, lower rents compared with the city centre and fringes of KL and being a place where people want to be are drawing companies to set up office in PJ,” Lau adds. Although the supply of purpose-built offices in PJ has risen 28.31% to stand at some 17 million sq ft as of 3Q2018 from 13.25 million sq ft in 2013, the PJ market is still a relatively small one compared with the KL office sector which saw the supply of office space jump 15.32% during the same period. With the existing supply of 89.77 million sq ft as at 3Q2018, the total volume of KL’s office space based on Napic’s data is about 5.3 times larger than PJ’s. In 2018, only one en-bloc prime office building was completed in PJ and that was Nucleus Tower in Mutiara Damansara, according to Lau. The 25-storey development consists of Grade A office space and retail podium offering a net lettable area (NLA) of approximately 238,000 sq ft.
CapVen Consultancy head of investment and consultancy Serena Yeong also notes that the slowdown in the overall office market has only affected the PJ office market mildly due to the strong demand and limited office supply in PJ. Among the notable office buildings that CapVen Consultancy has been tracking in PJ (Table 1), seven of them saw their occupancy rate rise in the range of 1.4% and 19.5% between end-2017 and 3Q2018 due to the entry of new tenants and expansions made by existing tenants, she says. Meanwhile, six buildings registered a drop of between 1.5% and 7.4% in occupancy rate during the same period. The occupancy rate of another 10 buildings had remained unchanged. Nevertheless, the 24 office buildings recorded a decent overall average occupancy rate of about 90.37% as at 3Q2018. “In the last five years, there were not many new office buildings in PJ particularly the Grade A office buildings that are sought after by MNCs. 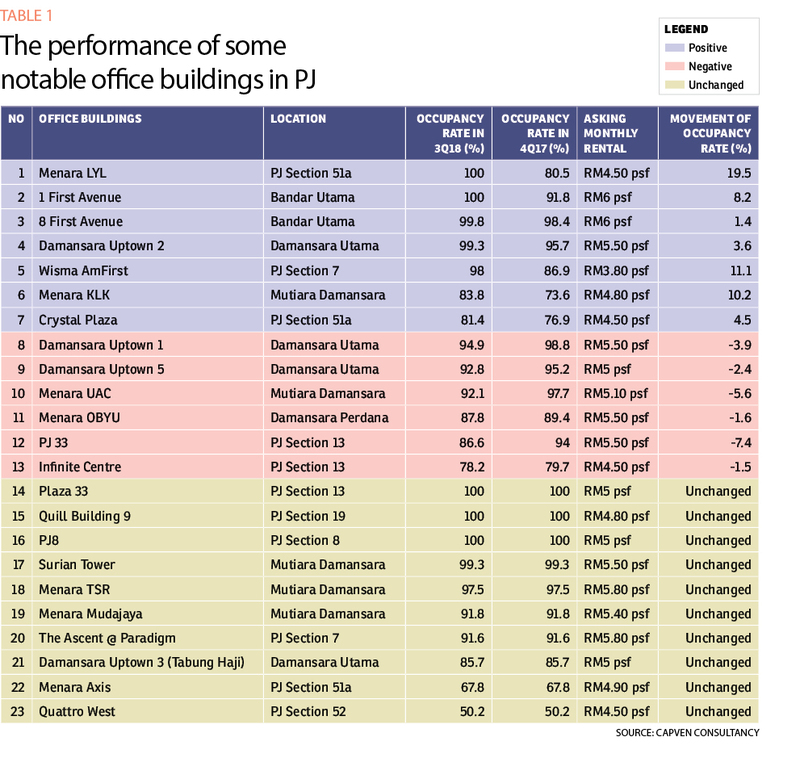 “A good number of office buildings in PJ are owner-occupiers, hence the availability of the office spaces for rental are also less than in KL. This is also a reason why the PJ office market isn’t experiencing a slowdown like KL,” she shares. Yeong adds that PJ has become a preferred location for companies to relocate and expand especially shared services, call centres, tech industries and e-commerce companies. Looking ahead, PJ will usher in more prime office buildings with four of them slated for completion in 2019, namely Menara Star 2, Symphony Square, KYM Tower and 1 PowerHouse (Table 2). In view of the new supply, JLL’s Lau expects the average occupancy rate in PJ to be slightly impacted in future. “Nevertheless, rents are likely to remain stable despite the stronger competition due to the good quality of these new buildings and with higher demand likely,” she offers. Nevertheless, the outlook for the PJ office market in the next five years remains bright as the market still has room to grow, says CapVen’s Yong. “But developers and landlords have to be creative with the design and concept of the office buildings they are planning to build. They need to look into what tenants and occupiers need when it comes to their work or office spaces,” she says.